The Ford Explorer is a staple in the driveways of adventurists across the United States. 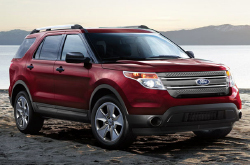 If you love to travel and explore, the 2013 Ford Explorer was designed especially for you. You can take the road less traveled with confidence that your SUV is equipped to tackle rough roads and rocky terrain. Plus, it can tow up to 5,000 lbs. when properly equipped. With an all-new Sport model, the Explorer "continues to widen the already-formidable gap between it and competing SUVs," according to Cars.com. This new arrival adds 'exciting performance' to the Explorer's long list of positive attributes. Learn even more about the 2013 Explorer at Peoria Ford. Underneath the video below you'll find a full review with details about the Explorer's powertrain, safety features, cabin amenities and much more. If you want to know what owning the 2013 Ford Explorer in Phoenix might be like, see what it's all about below. The Explorer has many competitors, but with its incredible combination of rugged performance, efficiency, safety and luxury accommodations, we're more than sure that it will exceed your expectations, while meeting all of your unique needs. When considering the 2013 Ford Explorer head-to-head with the 2013 Jeep Grand Cherokee, Buick Enclave, Dodge Durango, Mazda CX-9 and the Chevrolet Traverse, and you can discover that the Explorer scores higher those autos in various parts. Pay attention to the hightlights below. Explore backcountry roads in an SUV crafted for this very purpose. The Explorer offers a rugged performance when you need it, but also shows off a more refined side, making it an excellent SUV for everyday city or suburban cruising. Take a spin in the new Ford Explorer at our Phoenix area dealership, conveniently located at 9130 W Bell Road, just off N 91st Avenue. Visit us to see how the Explorer's many cutting-edge features work, including technologies like an available rearview camera and optional MyFord Touch interface. The rearview camera has several functions, which include easing the process of trailer hookup; the camera has a screen with guides that can help you align the SUV when you're hooking up a trailer. The MyFord Touch system also serves many, many functions, and has received numerous enhancements over the last year, including faster touchscreen response time and improved voice-command technology. See these features today at Peoria Ford! And remember to ask about our latest manufacturer incentives and dealership discounts! When combined you're sure to get a terrific deal on your next SUV.